Old fashioned & down home! Built right across from the Old Worman Mill & next to NFS, this house was constructed in 1910+/- by Dan & Ruby Worman, who were granted a homestead by Pres. Truman. It is bursting w/character! In the living room the walls & ceiling are wood from the mill w/lovely high open beams & stone mason fireplace is a focal point, oak hardwood floors & there's a sunny bonus room which is also used for dining. Downstairs has a lg. master BD w/a walk-in closet & a 2nd BD w/a walk-in closet. Country kitchen recently remodeled w/beautiful pine cabinets & tile counter tops w/a laundry room adjacent to the kitchen. Upstairs has 2 BDs needs a little TLC & a 1/2 BA which needs to be completed. Beautiful views off the lg. covered porch. 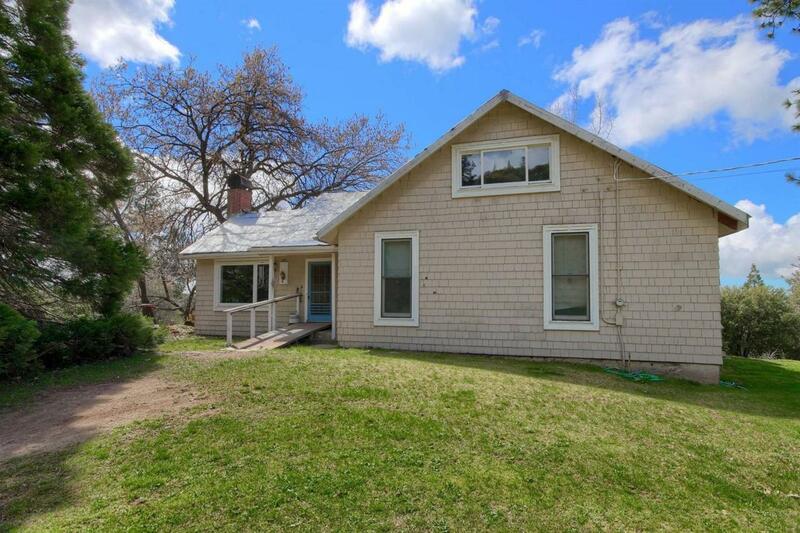 An oversized 2 car stucco garage, old workshop w/wood floors & room to park a tractor. Beautiful gentle landscape, fruit trees & even a Sequoia which Ruby planted as a young woman. Just waiting for the right people to love it!